The Brillo International Bounce was launched in 2013 by Graham Taylor as a competition exclusively for Small and Medium dogs. It was named after a small dog he used to have - and yes, you guessed it, his KC name was Brillo Pad. The 2017 qualifying heats will be held at the following shows. Click on the show link to go to the results. For more information about Agria Pet Insurance and Agria agility, visit www.agriapet.co.uk and www.agriapet.co.uk/agility/. Shirley Wells and her hard working team officiated at our first heat of the Agria Brillo Bounce competitions for 2017 at the Lincoln show on 23rd April. The Somerset Agria Brillo Bouneheat heat took place at the Severnside DTC hose on1st May, judged by Sorcha Price. The 4th heat of the Agria Brillo Bounce at the High Peak Show on 14th May was judged by Andy Gillibrand. The 5th heat of the Agria Brillo Bounce was held at the Wye Valley Premier Show on 3 June 2017, judged by Angela Freeman (Small) and Sally Archenhold (Medium). The 6th heat of the Agria Brillo Bounce was held at the Oswestry Open on 3 June 2017, judged by Rachael Rogers. The 7th heat of the Agria Brillo Bounce was held at the Golden Valley Open Show on 17th une 2017, judged by Tim Stanbrook. Jackie Kenny judged Heat 8 at Dogs Unleashed on 24th June 2017. Judge Carol Disley with her Just Dogs Live winners on a very warm 9th July 2017 at the East of England Showground. On 16th July 2017, Judge Bas Wood presided over the ring at the Rugby Championship Agility Weekend at Catton Hall to find the winners of this heat. So with all the heats across the country now complete, can we thank all the hard working show secretaries; judges and ring parties and host venues for their support in 2017. Some 72 invitations have already been d ispatched to our finalists to join us at Agria Brillo Bounce Grand Final at the British Agility Championships in Bedfordshire on Saturday 21 October 2017, kindly judged by International Agility Judge Jorges Pires. I am sure everyone would want to join with all of us at Agria and wish them the very best of luck at the final. 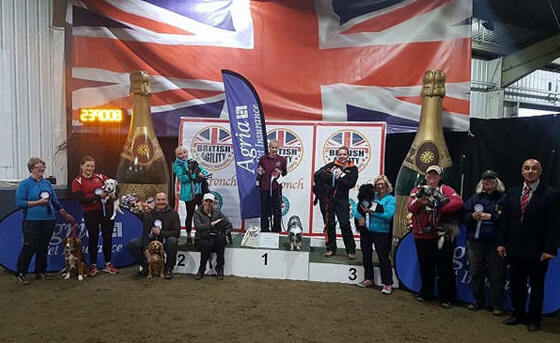 The Agria Brillo Bounce Finals, kindly judged by international agility judge Jorge Pires, were warmly welcomed the British Agility Championships on 21st October. As the only competition in the UK open to all grades of Small and Medium Agility dogs, there were qualifiers at each size from all 24 heats - all vying to be one of the two overall winners. As the first two rounds were not run against the clock, Jorge Pires brought some interesting course design to the competition. The crowd around the ring willed the finalists to get a clear round. Jorge was joined by Martin Tait in judging the Agility round leading to the early evening final which were live-streamed around the world. Jorge very kindly added some words: 'I had the honour to design and judge the Agria Brillo Bounce Finals. Firstly, thanks for inviting me to England. It was a great opportunity to judge such an interesting competition – one in which the smaller size of the dogs does not reflect the grandiosity of the competition. Secondly, thank you to all competitors for giving their best. Both the course walk – thinking about the different options, selecting the best line for their own dog and then running so they could achieve the best place were pretty interesting. To the winners, let me say massive congratulations. And for the other competitors, I’m pretty sure that all of you did your best - and that is also winning. It was amazing to see several dogs overcoming their own difficulties in some not so easy courses. Most of all, you showed the ability to run and handle your dogs while having so much fun. That is what agility is all about. So, I would say that all of you touched me somehow and, for me, you are all winners. With some bubbly to help celebrate, a share of more than £200 of prize money and a £250 voucher to each of our winners to spend on a DogFriendly holiday, we reckon a good day was had by all. With many thanks to our hosts, British Agility Championships, our judges, our sponsors - Agria Pet Insurance and DogFriendly - and most of all, to our finalists for coming to take part. If you were not successful this time, there’s always next year and we look forward to seeing you then!